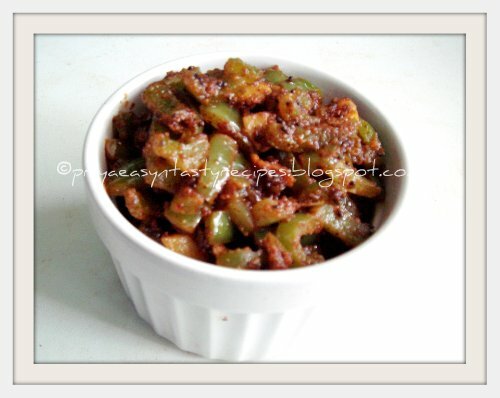 Weekend, i got a beautiful opportunity to buy a bag of green bellpeppers for dead cheap price, immediately my H asked me whether its gonna be capsicum week, with a smile i said y not...I dont want to disappoint him so our today's sunday lunch went for this delicious capsicum masala rice along with king frish fry..Both together tastes fantastic and we had a beautiful and delicious sunday lunch..This masala rice goes for a special spice powder prepared along with few spices,grated coconut, sesame seeds and peanuts..This rice doesnt even need onions or either ginger garlic paste, so no chopping, sauting and all..Sending to Akila's DIsh Name Starts With C..
Heat few drops of oil, roast all the ingredients given in the list 'To grind',one by one until they turns golden brown, grind them as fine powder and keep aside..
Heat enough oil, lets splutter the mustard seeds, curry leaves, add immediately the chopped green capsicums, sauté for few minutes, add the grounded powder and sauté again for few seconds, now add the cooked rice,roasted cashew nuts and salt, toss gently everything until the rice get well mixed..Serve hot with papads..
Its always a pleasure for me to make some home made paneer, quite been a long i havent made some home made paneer and this weekend i really wanted to make some paneer and prepared almost 3cups of fresh paneer, the famous Indian cheese..Immediately i wanted to give a try to make some sweets with this fresh home made paneer, also diwali was just around the corner so i was looking something as new sweets with paneer..Finally i went to paneer burfi, which was quite easy to prepare at the same time its tastes fabulous, needless to say more coz the picture itself say how tastier these burfis are..Yep we loved it and this sweets turned out super delicious, a prefect Diwali sweets..
Take the paneer,saffron strands, milk powder, powdered almonds, sugar, mix everything well,keep aside..Heat the ghee in a heavy bottomed pan, add this mixture and stir in low flame until the ghee gets separates..Remove from the heat and pour this paneer burfi over a greased plate,spread the burfi with a flat spoon..Sprinkle the melon seeds over the mixture, keep aside and cool completely.. 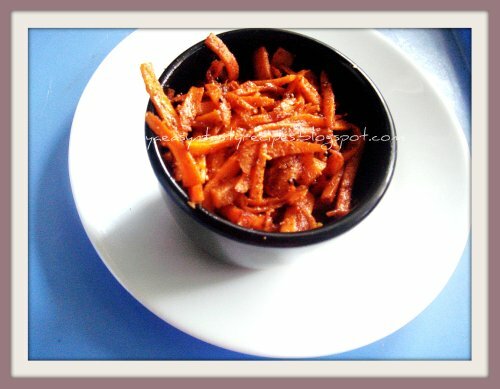 Try out this simple, quick,also a filling dinner whenever u feel bored of having the usual chappathis, just cut the leftover chappathis as long strips and sauté them with veggies of ur choice spiced with tandoori masala powder and ketchup u will get this beautiful looking tandoori chappathi noodles..This dish goes for a quick cooking process and you can make this dish even for a potluck party menu or else for lunch box menu, whoever dont like chappathis will definitely love having this yummy dish, also u can use any sort of meats or else eggs for making non vegetarian version of this noodles..This chappathi noodles can also suits prefectly for an evening snacks & am sending it to Virtual Party-Snacks guest hosted by Ruchikacooks, event by Shabitha..
Heat enough oil, sauté the onions, slit opened green chillies until the onions turns transculent, add the veggies sauté with enough salt until they get half cooked (dont over cook, veggies should be crunchy)..Add immediately the tandoori masala powder, ketchup,coriander leaves and cook until everything get well mixed...put off the stove, garnish with spring onions.. 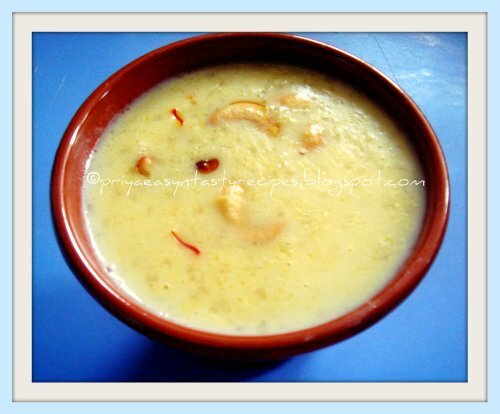 Recently i joined a contest going on at Manjula's Kitchen and this month's ingredient is Rice, after breaking my head finally i wanted to make something different as phirni since its my favourite dessert..Its really a pleasure when ur recipe got selected among the first five best recipes, voila mine been selected and now the voting is going on in Manjula's Space, dont forget to vote for me..I surely need ur supports and votes to win this contest friends. 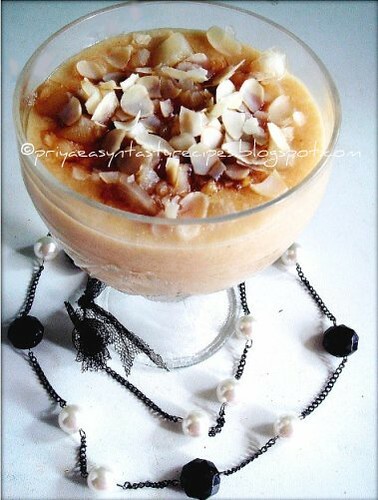 Coming to the recipe I love phirnis and rarely heard peoples saying no to this beautiful milk based dessert, but this time i wanted to make them with a twist using fresh pineapple chunks, since there were some leftover fresh pineapple chunks also with home made caramel syrup..Both together turned out this beautiful looking phirni as a rich and wonderful dessert..If u are bit lazy or u dont prefer to make ur caramel syrup u can definitely go for store bought one, this fruity rice phirni tastes amazing when they served chilled, eventhough i enjoyed them warm..Adding cream is completely optional and u can skip very well the fresh cream. 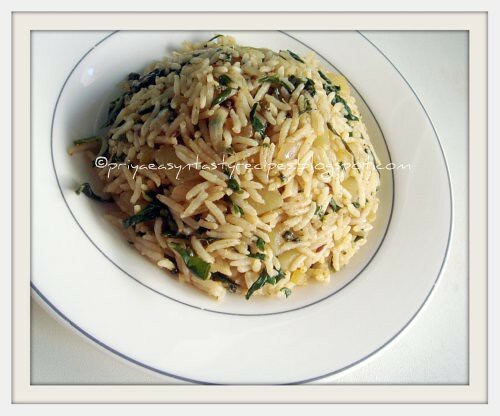 Wash and soak rice for an hour..Keep half a cup of milk aside and boil the remaining milk..Drain the rice and grind it as fine paste using the cold milk..Make a caramel syrup with sugar and a teaspoon of water, keep aside. Add the grounded rice paste to the milk and stir it continuosuly until it turns bit thick..Add the sugar,caramel syrup to the cooking rice paste. Meanwhile heat the ghee, keep aside a tablespoon of pineapple chunks,roast the remaining pineaple chunks until they turns golden brown.. 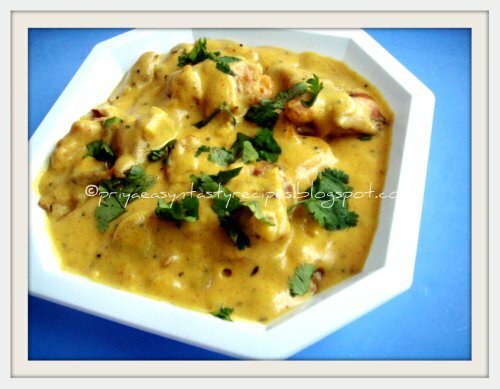 Grind this roasted pineapple chunks with some water as a thick paste..Add this pineapple paste and fresh cream to the cooking rice mixture..give a stir..Add the cardamom powder;nutmeg powder to the cooking phirni and put off the stove. Decorate the pineapple chunks and almond flakes over the phirni, drizzle the caramel syrup..Arrange in fridge for atleast an hour.. 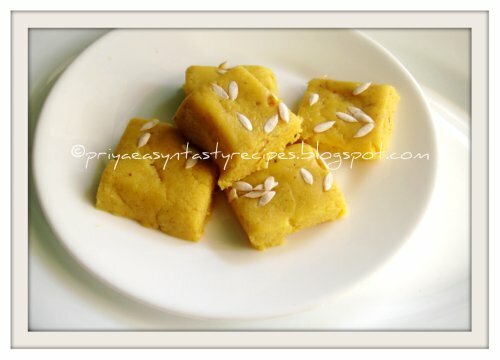 If u have loads of milk powder, just give a trial to the burfi, u wont ever regret making this cute looking burfi..I made a sort of mawa/khoya using heavy cream and milk powder and used this khoya with almond powder along with a sugar syrup with saffron strands for making this burfi..This burfi goes for easy ingredients, not even a single drop of ghee or butter at the same time quite easy to make too, i tried this burfi today as trial since diwali is nearing very quickly, also its time to plan some sweets for Diwali na..This burfi tastes like pedas also at the same time like katlis, anyhow we loved this sweets and needless to say they gets vanished very quickly too..
Heat the heavy cream and milk powder in simmer,cook until they turns as thick dough(the dough gets off completely from the vessel). Now make sugar syrup with sugar,1/4cup water, saffron strands as single string constitency, add the almond powder, sugar syrup to the milk powder dough in a heavy bottomed vessel and cook until they turns thick, pour this mixture to a greased plate or else in a plate lined with wax paper, sprinkle the nuts over the burfi and let them cool completely..Slice this burfi as u desire and enjoy them atleast after an hour.. These cute burfis tastes more better after a day.. 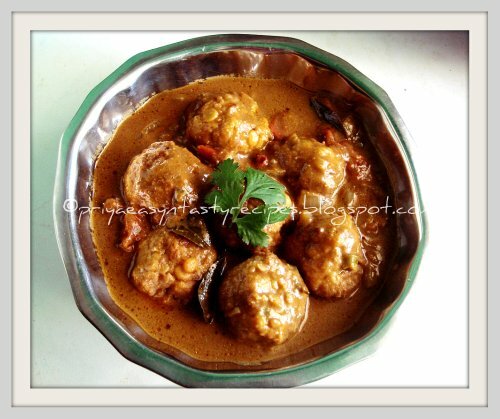 I have prepared this tangy gravy few days back with Steam cooked banana blossom dumplings, this gravy tastes awesome with hot steaming rice and papads or either with hard boiled eggs, actually these dumplings can be enjoyed with any hot sauce for snacks, since i finished them more than as i expected i was pulled to make some gravy with those leftover dumplings, i dont regret for making this gravy with those dumplings coz am a great fan of paruppu urundai kuzhambu and i can survive with this gravy for a week or more than that, yep these gravy tastes terribly awesome even after a day, which i prepared quite a different way from the usual tamarind based gravy, i used a grounded paste prepared with poppy seeds, peppercorns, shallots and coconut for making this gravy..Also needless to say how banana blossoms are healthy with numerous medicinal values, if quite advised to have atleast twice a month this healthy veggie as anything in our menu..Making this veggie as dumplings is quite definitely a best way to enjoy this healthy veggies. Dry roast the poppy seeds and peppercorns until the aroma comes out, take these dry roasted seeds with grated coconut shallots and grind as fine paste along with water, keep aside..
Heat enough sesame oil, let splutters the mustard seeds, fenugreek seeds,curry leaves & cumin seeds, add immediately the cubed onions, crushed garlic cloves and chopped tomatoes,sauté everything until the onions turns transculent, add the grounded paste and cook in low flame until the oil gets separates, now add the tamarind extract, red chilly powder and coriander powder along with salt and cook the gravy with lid closed until the oil gets separates...finally add the already prepared dumplings cook in simmer for 5minutes and put off the stove.. 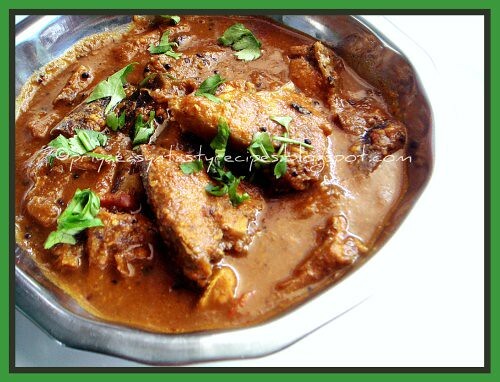 Serve along with rice and papads.. Simple stir fry with broad beans and potatoes spiced up just with pepper powder and poppy seeds spice powder, this stir fry is quite an easy side dish which goes awesome along with hot steaming rice and rasam or else along with some rotis, just mash this stir fry to make as a filling for making some parathas, yep u have loads of choice to finish up this simply stir fry...Adding potatoes with broad beans, makes this stir fry more tastier and a real feast for potato lovers..We loved it..
Heat enough oil, let splutters cumin seeds & mustard seeds, add immediately the chopped onions and curry leaves, sauté until the onions turns transculent, add immediately the chopped broad beans and salt, sauté until they shrinks a bit..now add the cubed potatoes along with poppy & quinoa spice powder, sauté for few minutes..finally add the pepper powder, sprinkle some water and cook until the veggies get well cooked..
Chettinad cuisine are always famous for their spiciness and for the dishes cooked with freshly grounded masalas, its quite a famous South Indian cuisine, we guys love anything from Chettinad cuisine..Yesterday i prepared this fish gravy as Chettinad version..Freshly grounded masala turned out this meen kuzhambu very fabulous and this slightly thick gravy suits absolutely prefect with rice, idlies or with crispy dosas..If u want to serve this kuzhambu for ur dinner,prepare this gravy atleast before 5hours, so that the fish soaked in this gravy tastes simply delicious,this gravy tastes even better if u enjoy them the next day..This is one of my Hubby's favourite, he love this Chettinad meen kuzhambu with papads, his favourite combo. Roast and grind as fine paste all the ingredients given in the list 'to grind' with enough water..Heat enough sesame oil, splutter the mustard seeds, fenugreek seeds and curry leaves, add the chopped onions,crushed garlic and fry until they turns brown, add immediately the chopped tomatoes, grounded masala, turmeric powder and fry until the oil get separates in simmer, add the tamarind extract, enough water and salt to the veggies..Bring everything to boil, immediately put the flame to simmer and add the fish pieces, cook everything for 10minutes in simmer, put off the stove once the oil gets separates and add the chopped coriander leaves.. Enjoy with rice and papads.. I usually make bittergourd as simple stir fry using sometimes with prawns, but this masala is completely a new dish which is prepared actually for filling and making out some paratha with this bittergourd masala, but finally me and DH finished them with rice and boiled eggs also needless to say that this bittergourd masala goes terrible awesome along with rotis too,i never tried adding ginger garlic paste along with bittergourd and also i used Poppy seeds & quinoa spice powder while making this masala..This masala tastes fabulous and we loved it..Since i used poppy seed spice powder, this masala goes directly to Vegetable Marathon - Bittergourd guest hosted by Nithu, event by Anita..
Heat enough oil, let splutters the mustard seeds and urad dal, add immediately the chopped onions, slit opened green chillies,ginger garlic paste and sauté until the onions turns transculent, add the chopped bittergourd pieces, along with salt and cook until the veggies get half cooked, add the poppy seeds & quinoa spice powder, coriander powder,curry leaves and cook in simmer until the veggies get well cooked(sprinkle water if needed), mash the bittergourd pieces slightly, put off the stove.. 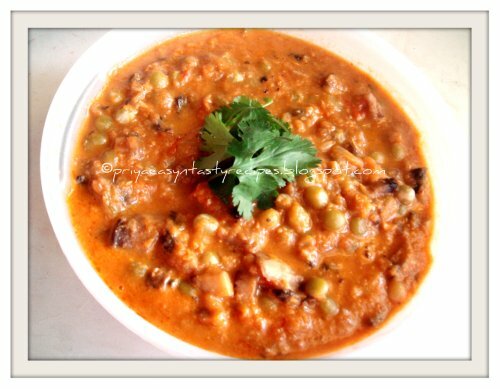 Serve hot along with rice or rotis.. 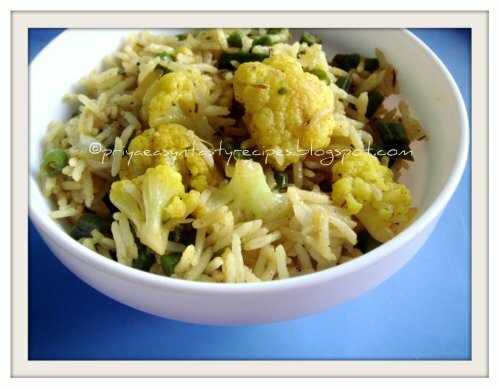 Whenever i feel lazy to cook i immediately go for one pot meal that too along with veggies, coz personally i feel that making one pot meal with different veggies was quite one of the best and better way to feed my family with veggies, this time i prepared this simple and delicious quick rice with sauteed cauliflower and green beans with already cooked basmati rice..This rice is really very quick, easy and suits prefectly awesome as lunch box menu..This rice along with spicy potato fries tastes simply delicious and we enjoyed it for our today's lunch..Sending to Akila's The Dish Name Starts With C..
Heat enough oil, fry the cumin seeds and bay leaves ..Add the chopped onions, slit opened green chillies, sauté until the onions turns transculent, add the cauliflower florets,curry leaves,turmeric powder,salt and green beans, sauté everything until the veggies get half cooked..Now add the cumin powder,red chilly powder to the veggies, sauté for few minutes..finally add the cooked rice, toss everything gently until the rice and veggies get well mixed.. 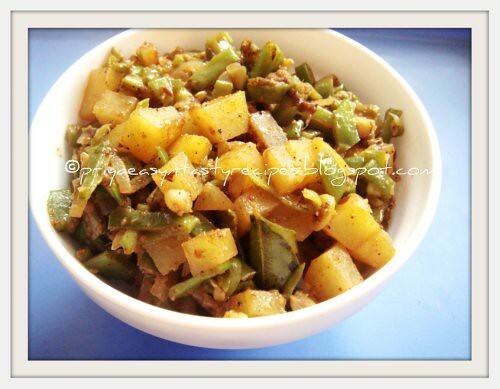 Enjoy with any spicy side dish or potato fry.. Most of us would have heard or made poppy seeds spice powder which goes terribly awesome with hot steaming rice topped ghee and papads, this is my version of that same poppy seeds powder with quinoa..Needless to say that this podi tastes fabulous eventhough i have added quinoa in this spice powder..This powder goes always fabulous to spice up many dishes, yep i tried making a stir fry with broad beans and potatoes with this powder and pepper powder and its tastes awesome, i'll be posting them very soon too..This poppy seeds spice powder can be enjoyed very well with rice also ....Obviously this is my one more entry to CWS-Poppy Seeds guest hosted by Sudeshna, event by me..
Dry roast the poppy seeds and quinoa together until they change colour,keep aside let it cool..heat few drops of oil and roast the coriander seeds, channa dal, urad dal, red chillies..Grind everything with salt until bit coarse powder..
Conserve in air tightened box..Enjoy with rice! Everyone in at my place loves spinach as anything, after making some fried rice, fried pakodas with spinach, my recent rice dish is this aloo palak pulao, most of us never says no to anything with potatoes and we guys are huge fan of this beautiful veggie, with spinach its double ok for us..I can definitely say that aloo palak is our all time favourite and this pulao was one of the best and better way of feeding my family members with aloo and palak..This pulao goes absolutely for easy preparation and its tastes fabulous, yep needless to say aloo and palak in rice never goes wrong..Along with papads, raitas or with simply chicken fries, this pulao goes tremendous and its tastes extremely awesome even as lunch box menu..Do try friends u will definitely love this pulao and damn sure that this combo never fails at all..Sending to CMT-Rice guest hosted by me, event by Jagruti..
Wash and soak basmati rice for 5minutes with 4cups of water, meanwhile heat enough oil in a heavy bottomed vessel or pressure cooker, fry the bay leaves, fennel seeds and cardamom, immediately add the chopped onions, ginger garlic paste with salt,cook until the onions turns transculent, add the chopped potatoes and sauté along with red chilly powder, garam masala powder, pepper powder and cumin powder, until the potatoes get half cooked..now add the chopped spinach leaves, just sauté for few seconds..Strain the soaked water from the basmati rice and add to the cooking veggies, bring to boil..Add the soaked rice to the cooking water, cook everything in high flame for few minutes, (if u r using pressure cooker,cook for two whistles and put off the stove)put off the flame in simmer..
Cook until the rice get well cooked and water gets completely absorbed..Serve along with papads, raitas or spicy chicken fries..
Been born and brought up in a seashore city, we guys love to have atleast twice a week some seafoods, but coz of Navarathiri and many more festivals i couldnt make seafood fries or dishes since quite a long, this weekend i prepared some prawn masala along with spring onions instead of onions, yep i used spring onions and the flavour of spring onions turned out this prawn masala truly delicious.. With hot steaming rasam this masala goes prefectly yummy and my hubby was really happy to enjoy this prawn masala with his sambar rice after a long, needless to say how he was happy to enjoy this prawn masala..
Heat enough oil, sauté the chopped spring onions,curry leaves and chopped tomatoes until they turns soft, meanwhile grind the fennel seeds and garlic as fine paste, add this paste to the cooking veggies and sauté for few minutes, add now the cleaned prawns and sauté until the prawns turns pink, immediately add the red chilly powder, coriander powder and salt, cook everything in high flame for 2minutes, put the flame in simmer, close the pan with lid..
Cook the prawns until the oil get separates, finally add the chopped coriander leaves and serve hot.. 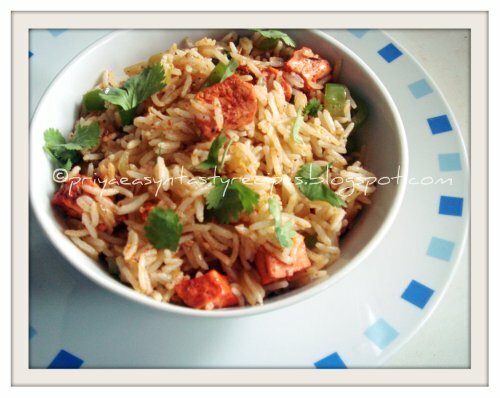 Sometimes we need to change our daily lunch menu with some variety rice, while going through Madhuri's Ma Recipes, i got hooked with this masala baath which ressembles quite like vangi baath but this dish doesnt go for tamarind or for a special vaangi baath powder, her clicks tempted me a lot and i tried out this rice for our today's lunch and served along with some crispy pakodas..This masala baath was a complete one pot meal which doesnt even need anything as side dish, a prefect lunch box menu too..Thanks to Madhuri for sharing this Masala Baath and we loved it..Also sending to CMT-Rice guest hosted by me, event by Jagruti..
Wash and soak the rice in water for 15minutes, meanwhile chop the brinjals as cubes and let them sit in water with pinch of salt and tamarind pulp..roast the red dry chillies, coriander seeds, grated coconut ,cumin seeds one by one and grind as fine paste with some water.. In a pan, heat enough oil and fry the cloves, cardamoms, bay leaves until they turns brown, add the chopped brinjal, turmeric powder and cook for few minutes, add the grounded masala and sauté for few minutes in medium flame...now gently add the rice, 4 cups of boiling water and salt..
Cook everything in high flame for 5minutes, put the flame to simmer and cook until the rice get cooked and the water get completely absorbed, finally add the cashew nuts toss everything gently..Serve hot with any raita..
Sprouting is quite a routine at my place, we guys never ever say no to any sort of dishes with sprouts, our recent favourite is this sprouted black channa kurma..This kurma goes fabulous with hot steaming rice, also along with rotis, breakfast dishes like idli, dosai or just with toasted breads...Poppy seeds and coconut used in this kurma turned them very delicious at the same time as a thick kurma,if u dont like coconut u can completely omit them by replacing the cashew nuts, u may think whether this kurma is quite a rich gravy, may be but i dont bother to make sometimes these sort of gravies with either coconut or cashewnuts also at the same time this kurma. Most of my followers or my foodie bloggers would have know that am the mega winner of Food For 7Stages of Life hosted at Radhika's space, i won two cookbooks and one among those books was Punjabi subzis, i tried this dhingri mutter from that book by Tarla Dalal, this mushroom and green peas gravy tastes absolutely divine with rotis and even we loved it along with idlies and crispy dosas, i love Mrs Tarla Dalal's cook books much,when i won this book i was very excited to make many delicious subzis, this tomato based gravy with mushroom and green peas goes for an easy cooking process eventhough the ingredients goes for a bit long list...We loved this mushroom and green peas gravy very much along with ghee rice, yep both together goes prefect..
Heat enough oil in a pan, add the onions given in the list for gravy and saut& until they turns golden brown, keep aside..Take the tomatoes, melon seeds, green chilli, red chillies, ginger and garlic in a pan with half a cup of water and cook in simmer flame for 15minutes, cool and keep aside..Blend as smooth paste this cooked tomatoes chunks and browned onions together..Heat again some oil, sauté this paste in simmer for 20minutes till the mixture leaves oil..
Now heat the butter in a pan, add the mushrooms, peas and sauté till the mushrooms gets almost cooked, add the prepared gravy, tomato ketchup,chilli powder, garam masala, chopped coriander leaves, cream,salt and enough water, bring everything to boil..put the flame in simmer and cook for few minutes or until the gravy gets thickens.. Serve hot with rotis, rice etc..
Tandoori tofu bites are always welcome here, everyone at home love this bites just as appetiziers..This time i tried making a rice by combining tandoori tofu bites and capsicum, both together turned out the rice more flavourful, tasty and quite a filling rice..This rice goes prefectly even for a lunch box menu and this rice doesnt even need any special side dish...Also its an excellent way to feed whoever never like tofus..Yeah along with rice, they dont even notice these bites and will enjoy them, if u dont like capsicum u can very well add ur favourite veggies in this rice..Simple, easy and quick rice gets ready in less time, u can also prepare this rice with leftover cooked rice anytime..Sending this rice to Pj's Tasty Tofu Treats & to Akila's Dish Name Starts With C..
Add the tandoori masala powder, oil and salt to the cubed tofus and mix gently..Cook in microwave oven for 5-7minutes in high until they turn bit crispy..keep aside..
Heat enough in a pan, fry the cumin seeds and fennel seeds, add immediately the chopped onions, slit opened green chillies ,sauté everything for few minutes until the onions turns transculent..Add the chopped capsicum, along with pepper powder, garam masala powder, coriander powder with salt, sauté for few minutes, take care not the overcook the capsicum chunks, now add the cooked rice, toss everything gently, finally add the already prepared tandoori tofu bites and coriander leaves to the rice, mix gently.. 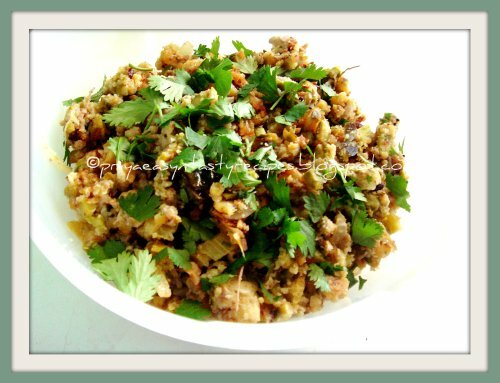 Serve with papads or with eggs. 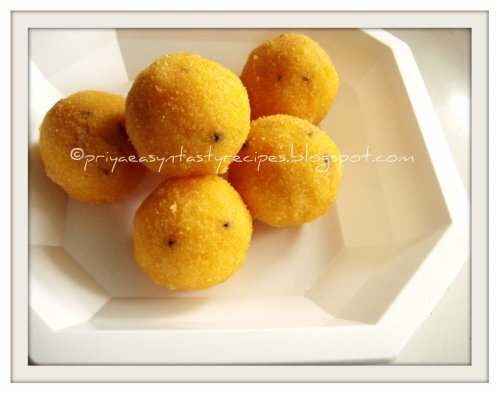 I never ever thought of making laddoos with cornmeal before, but this weekend since my sweet tooth craved for something sweet, i tried out this cornmeal laddoos as i didnt have rava..Cornmeal laddoos goes for few minutes and its get ready within less than 10minutes in microwave oven, once i prepared this cornmeal laddoos we didnt stop munching them and we loved it..This cornmeal laddoos goes exactly the same cooking process as we do for rava laddoos, believe me or not am gonna prepare this laddoos very often since everyone at home loved this cute looking laddoos..This laddoos stay best for 2-3days in room temperature if they are conserved them in air-tightened box..Sending this laddoos to CFK-Festive Foods guest hosted by Suma, event by Sharmi..
Heat the ghee and cashewnuts for a 2-3 minute in microwave safe bowl in microwave oven, take the roasted cashew nuts and keep aside, add the cornmeal to the heated ghee, mix everything well and cook for 5-7minutes high (stir in between twice)..take out the roasted cornmeal and grind this cornmeal along with sugar and cardamom as bit coarse powder, take this grounded powder along with roasted cashew nuts in a bowl, sprinkle the milk as per need mix everything well and make medium sized balls.. 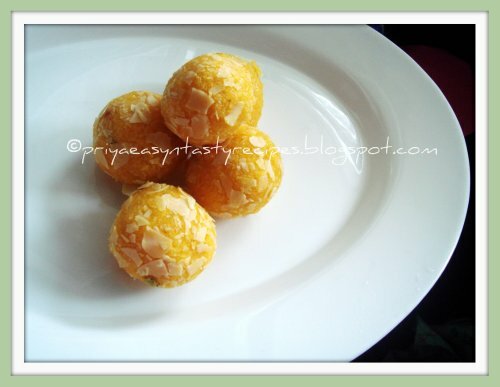 Arrange this laddoos in an air tightened box and enjoy.. When Jagruti asked whether i can host her event calling for Complete My Thali, without any hesitation i accepted immediately, coz her event was quite an interesting with different theme , this event is started in September and is continued for six months with each theme holding every 2 weeks also there is a humble and genuine cause behind this CMT event..
Every event comes with a prize, so when my thali is complete I will give the value of that one thali to someone else in the world who doesn't have the blessing of even a small amount of the food on the thali...The money will go to UNICEF....", wat a beautiful gesture na! 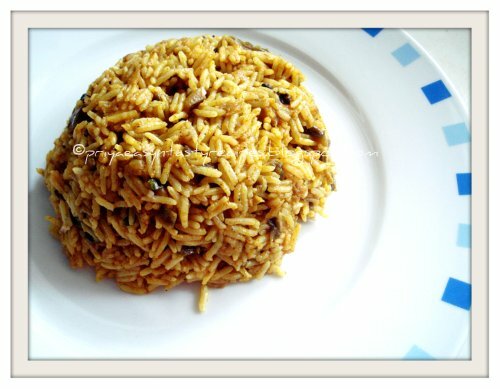 i was excited to be a part of this cause and am happy to announce that i choose rice as theme..
We Indians, cant live without rice atleast once a day, we do varieties of rice and specially South Indian thali cant be complete without rice..Cook anything as rice and send to me within two weeks, have a look how to send ur entries..
1)Cook any variety of rice with veggies,seeds or fruits, post between 20th October to 2nd November.Dont forget to link ur recipe with this post and Jagruti's announcement page..
3)Archived post should be updated with this link post and Jagruti's Announcement Page..
5)Non bloggers send their name and their recipe with a picture to Priyasuresh09@gmail.com.. 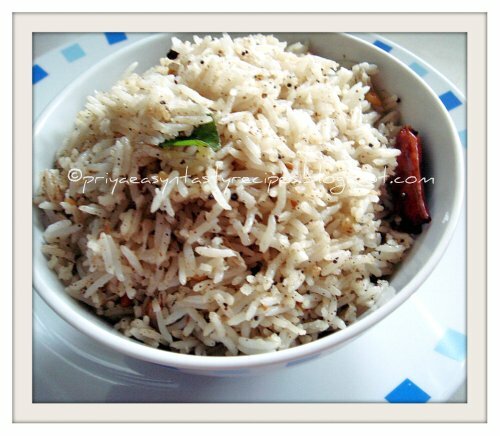 I came across this pepper rice at Kurinji's Space,the simplicity of this rice attracted me a lot coz my mom used to make this pepper rice with shallots, but Kurinji went for a simple, quick and easy preparation for making this rice..I loved this rice also this rice tastes absolutely awesome also a completely one pot meal, u doesnt even need anything as side dish, may be some papads but i enjoyed this rice without any side dish..Fresh grounded pepper and cumin powder added to this rice turned them super delicious with a fabulous flavour, thanks to Kurinji for sharing this easy pepper rice, will post soon my mom's version very soon..Sending this rice to Nupur's BB#8-One Dish Meals..
Dry roast the peppercorns and cumin seeds, until the aroma comes out, grind them as fine powder and keep aside..Heat enough oil, let splutters mustard seeds, urad dal, channa dal..add the red chillies,curry leaves asafoetida powder, fry until the chillies turn brown..add immediately the grated coconut and saute for few minutes, meanwhile add the grounded pepper-cumin powder and salt to the cooked rice, mix well and keep aside..Once the coconut get roasted add the rice and saute for few minutes..put off the stove.. 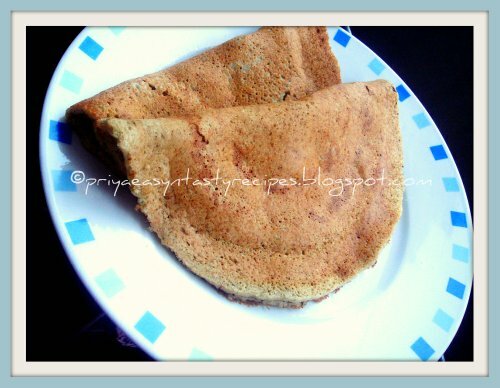 Enjoy with papads or with boiled eggs.. 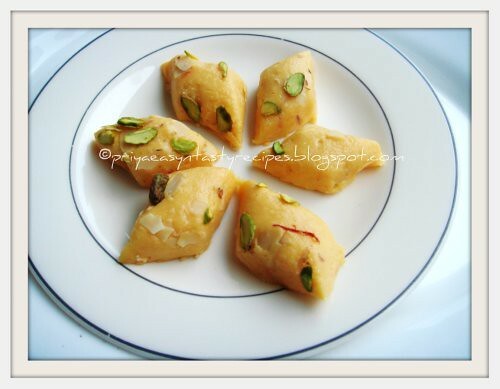 If u have loads of dates, just give a trial to this delicious halwa u wont regret at all also its a quick way to finish those dates sitting sadly since a long coz this halwa hardly goes for simple ingredients like pitted seedless dates, milk, sugar, ghee and cashewnuts..Its a beautiful halwa which suits prefect for a sweet tooth also at the same time loaded with many health values eventhough we use ghee in this halwa,coz i cant imagine halwa without ghee,if u dont like to use ghee u go for butter or else dalda, but the aroma of the ghee suits absolutely prefect for making dates halwa..One more easy breezy diwali sweets am gonna prepare for the sure, yep this halwa goes for easy cooking process and even my little one loved it..Actually the dates i have used in this halwa wasnt that much sweet, thats y i have added sugar, in case if urs were sweet, u can definitely skip the sugar..Sending to CFK-Festive Foods guest hosted by Suma, event by Sharmi..
Fry the cashew nuts until they turns golden brown, keep aside..In an another pan, cook the dates and milk until they turns soft..let it cool and grind as fine paste..Cook the dates paste and sugar until its turns as thick paste, add the ghee and the roasted cashew nuts, stir continously..this paste will get off from the bottom of the pan after few minutes, immediately pour this halwa in a greased pan and cut as u desire once they get cooled.. 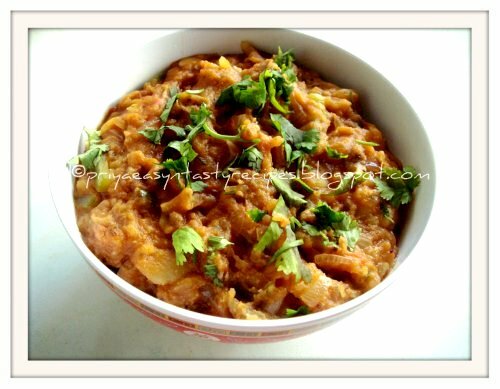 Enjoy..Can stay prefect in room temperature for 2-3days..
Baingan bharta, famous Punjabi roasted mashed eggplant dip was one of my favourite, this time i got hooked with Aipi's Baingan Bharta which i bookmarked at her space coz this mashed eggplant is prepared along with a variety of veggies which sounds quite delicious for me, yep this baingan bharta goes for cooked and mashed potatoes, bellpeppers and mushrooms which pulled me to try out this dish today for our dinner and i served this baingan bharta along with rotis, both together turned absolutely delicious our dinner and works out wonder..Thanks a ton to Aipi for sharing her hubby's way of making baingan bharta, hats off to ur man Aipi..Even my man loved it along with rotis which was a hard task for me always whenever i prepare anything with eggplants..Obviously this is my entry to Priya's & Aipi's Bookmarked Recipes..
Poke 2-3 holes on the eggplant and microwave in high for 5minutes,take out the eggplant and spray some oil over the eggplant, broil the eggplant in oven for 30-40minutes on turning the eggplant every 15 minutes..Take out and keep aside..let it cool, peel the skin off the eggplant and scoop out the flesh and keep aside..
Heat oil in a pan, add the asafoetida powder, cumin seeds, mustard seeds and stir until the seeds crackle, add immediately the minced garlic and chopped green chillies, saute until they turns golden brown, add the chopped onions, salt and saute for few minutes, add the bell pepper and saute for few minutes, immediately add the mushroom and cook everything in high..Immediately add the tomatoes, turmeric powder until the tomatoes turn mushy..Add the mashed potatoes and eggplant flesh with the coriander powder and mix, cook everything in lower flame..
Keep mashing the veggies, now add the red chilly powder and amchur powder..keep stirring until the mixture turns thick..Serve hot with rotis,rice or along with bread toast..
Watever as jelly goes immediately to my favourite, while cleaning my freezer i came across a packet of frozen strawberries which i have freezed few months back..Since the quantity of strawberries was nt that much enough to makes bakes or any sort of desserts, i thought of making them as jelly using agar agar powder with a fresh strawberry juice..This jelly was quite refreshing, delicious and tastes absolutely yummy..This strawberry jelly was an excellent dessert to enjoy after a simple lunch as its really goes for simple ingredients..Sending to Healing Foods-Agar Agar guest hosted by Niloufer, event by Siri..
Add the sugar to the strawberry juice, mix everything welll and strain the juice keep aside..heat the agar agar powder,food colouring with half a cup of strawberry juice, slowly add this heated juice to the fresh strawberry juice, pour this mixture to the any sort of moulds and arrange in fridge for an hour.. 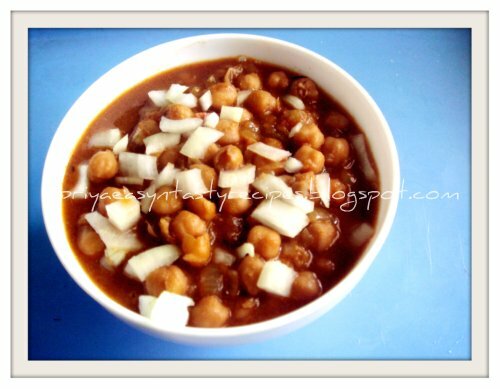 I can have with anything channa masala, even along with idlies, yeah i love it that much..I really wanted to try the famous and quite popular Punjabi chole,this weekend i prepared this Punjabi chole from Dk's Chef In You coz her Punjabi chole was quite an easier preparation also goes for really for some simple ingredients, i have completely got hooked to her version, as usual its a big hit at home and we enjoyed having with rotis..This channa masala of Punjabi goes for a dark gravy coz of pressure cooking chickpeas with a tea bag, thats y the white channas looks like black chickpeas in the gravy and we thoroughly loved this dark coloured channa masala..Thanks to Dk for sharing this yummyilicious gravy, obviously this Punjabi choley goes directly to Flavours of Punjab guest hosted by Pari, event by Nayna, since i didnt have tamarind paste i just went for amchur powder, this masala was quite a different gravy with bit tanginess, bit sweetness and spiciness..
Cook the chickpeas with turmeric powder, bay leaf and teabag in a pressure cooker upto three whistles, heat enough butter or oil,add the shahjeera and fry, immediately add the cumin powder, coriander powder and saute for few seconds ..Add the chopped onions,salt, ginger garlic paste and saute until the raw smell goes away..now add the chopped tomatoes, tomato puree and cook the veggies becomes mushy, meanwhile remove the tea bag and bay leaf from the chickpeas and pour the cooked chickpeas, amchur powder with the cooked water to the veggies, add more water if needed..
Bring to boil and smash few chickpeas while cooking the gravy..cook until the masala get thickens..Serve hot garnished with chopped onions and along with rotis..
Am damn sure that i have never prepared this much easier pickle ever in my life, yep this green bellpepper pickle gets ready within less than 10minutes coz of green bellpepper which gets cook very easily, needless to say that this pickle is very much easier as its an instant pickle..This pickle goes awesome along with curd rice,rotis or with rice porridge..Easy breezy, tangy pickle tastes marvellous and i liked it...Also i didnt used lemon juice or vinegar to give the tanginess to this pickle, i used amchur powder in this pickle..Believe me or not, even my DH loved this pickle very much coz he hardly love bellpeppers..We relished each and every spoon of this instant pickle..
Dry roast the fenugreek seeds and mustard seeds and grind as fine powder, keep aside..Heat enough oil, let splutters the mustard seeds, add immediately the grated ginger and minced garlic cloves, sauté until they turns golden brown, add immediately the cubes bellpepper chunks,sauté for 5 minutes (dont over cook), add now the red chilly powder, amchur powder and already prepared grounded powder and salt..sauté until the veggies get well coated.. Simple kheer prepared with caramel syrup and sago, which tastes truly delicious..This is quite an easy breezy kheer and the caramel syrup added in this kheer makes more delicious also at the same time gives a beautiful colour..This sweet dessert is today's Saraswathi pooja special and we enjoyed having them,actually since i had a some homemade caramel syrup,i tried adding them to this kheer without any knowledge and for my surprise this kheer tastes truly yummyilicious. 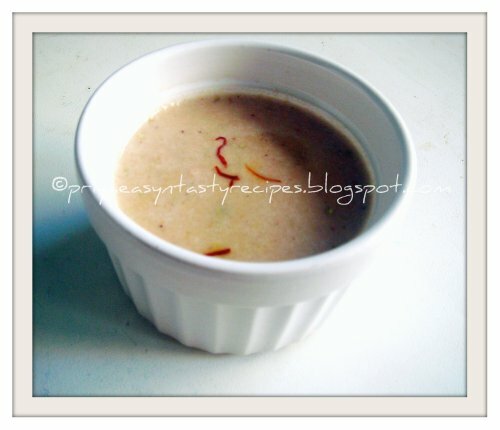 Cook the sago with water until they turns bit transculent..now add the milk, sweetened condensed milk, caramel syrup to the cooking sago, cook everything until the sago gets completely transculent and kheer turns thick, fry the cashews in ghee and add immediately to the kheer along with cardamom powder.. I can survive just with a dals and pickles for many weeks, while searching some rice dish through Dk's Chef In You i got hooked with this South Indian Kadambam rice, which ressembles quite like Bisi Bele Bath, my most favourite dish..While going through this recipe at Dk's space,this dish was truly very easy also its seems that this rice is her mom's version which was given by her mom's elder sister, so i immediately wanted to try this dish, eventhough i prepare almost the same rice...Yep each family have their own way of making this sort of rice with dals and veggies, even my mom makes something similar but she used to add some tempered spices to enhance the flavour of this rice..This kadambam rice was quite an easy rice dish and just with papads this rice tastes absolutely divine and we loved it..This is my another entry to T&T -Chef In You guest hosted by myself, event by Lakshmi..
Cook rice with 3cups of water, cook together the dals with enough water until they turns soft, meanwhile cook the veggies with enough water until they get half cooked and keep aside. 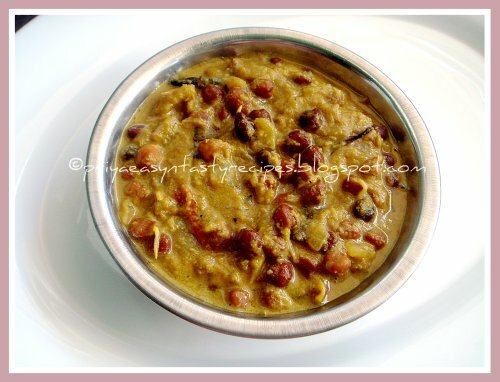 In a large pan, mix the tamarind paste with 3cups of water, add the salt, sambar powder, curry leaves and the already cooked veggies and cook for few minutes until the veggies get well cooked, mash the dals and add to the cooking veggies, until the gravy turns bit thick..
Add cooked rice to the dal-veggies mixture and gently mix everything..Garnish the rice with chopped coriander and ghee.. 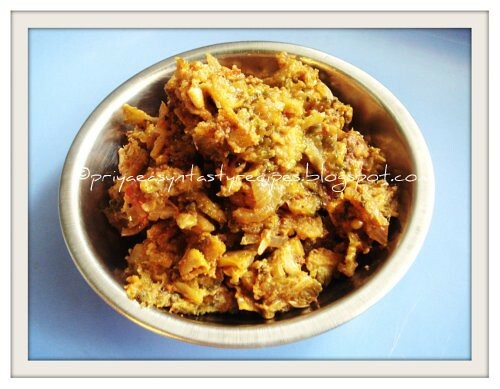 Serve hot with papads or either with pickles..
Our this month's challenga of Indian Cooking Challenge is Authentic Punjabi Kadi pakoras, this dish is quite famous in Punjab.. This punjabi kadi pakoras goes for fried onions dumplings soaked in yougrt based gravy which tastes marvellous when served along with rice or rotis..Srivalli choosed this recipe from Simran of Bombay Foodie, needless to say this goes for easy ingredients also easy cooking process and the result was a droolworthy thick kadi which tastes truly excellent..Thanks to Srivalli for choosing this effortless Punjabi kadi pakoras for this month's challenge and we enjoyed them with hot steaming rice..This punjabi kadi should be thick if its thin gravy then it will be the Gujarati version of kadi..
Make a thick batter with gram flour, salt, chilly powder with enough water,meanwhile heat the oil for deepfrying,once the oil is hot, dip the sliced onions in the batter and drop gently to the oil, fry until they turns crispy,keep aside..
Make a thin batter with yogurt, besan and water, keep aside..heat enough oil, let splutters the mustard seeds, cumin seeds, ajwain seeds and fenu greek seeds, add immediately the chopped onions and sauté until they turns slightly brown, pour in the yogurt-besan batter along with turmeric powder, salt and chilly powder..bring to boil and put immediately in simmer cook for half an hour by stirring them occasionally..when the gravy turns thick add the pakoras , garam masala and dry mango powder to the gravy, give a stir and put off the stove.. Enjoy with rice or rotis..
Poppy seeds are usually used in masala also its one of most important ingredients of garam masala powder used in our daily cooking and very much in North Indian dishes...This poppy seeds kheer is quite popular of Kannadigas of Bangalore eventhough its one of my favourite kheer which i used to prepare often as i learned it from my MIL..This kheer goes for simple ingredients and quite a delicious kheer to enjoy anytime..I prepared this kheer by dry roasting poppy seeds, raw rice and cashew nuts together, which is grinded laterly and cooked in coconut milk and sugar..Easy breezy kheer which gets ready very quickly also gets vanished in less time..You can also go very well for canned coconut milk, if u dont like to make fresh coconut milk at home for making this kheer..Sending to CWS-Poppy Seeds guest hosted by Sudeshna of Cook Like A Bong, event started by me also to Celebrate Sweet-Kheers guest hosted by Umm, event by Nivedita and finally to Only Festive Food Event guest hosted by Preeti, event by Pari..
Dry roast poppy seeds,basmati rice until they turns brown, finally add the cashew nuts and just roast for few seconds, put off the stove..Let them cool and grind these roasted seeds,rice n nuts as finepowder..Meanwhile grind the grated cococnut, cardamoms with enough water and strain the milk from grounded paste, repeat the process for 2or 3times..Bring boil the coconut milk along with sugar,put the flame in simmer and finally add the grounded powder of poppy seeds, rice and nuts to the simmering milk, add the saffron strands and put off the stove..
Feijoada is a well known and a popular Brazilian stew which is prepared with black beans along with meats, but i tried making them as a vegetarian stew using veggies and black beans..This stew is originally developed by the slaves to get use of less meat, but here am gonna make this black bean stew with vegetables spiced with garlic cloves, cumin powder, pepper powder etc..This goes for bit of work eventhough this stew is truly worth to try out...Serve this delicious and nutritious stew with steamed rice and greens, its a complete,filling and wholesome food..
Pressure cook the soaked beans with bay leaves, garlic and tomatoes for 3whistles...Meanwhile heat a enough olive oil and saute the onions,carrots, garlic and celery until the onions turns transculent, now add the cumin powder, pepper powder, dry chilli and oregano, cook for few minutes...add the veggies to the cooked beans and enough water to the beans and veggies, the mixture should be soup not dry..
Cook this mixture in simmer, adjust the seasoning and cook until the beans turns tender, finally add the parsley leaves and serve along with hot steaming rice or simply enjoy with breads.. 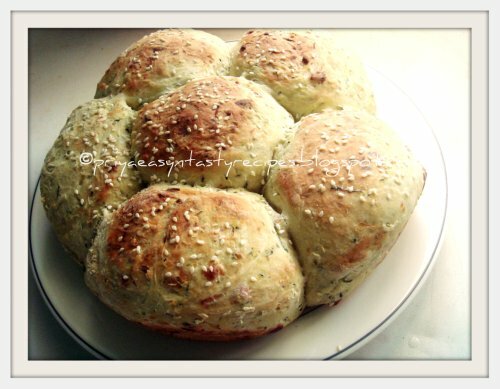 I cant stop myself to bake breads from DK's Chef In You and here comes my first bake which i prepared today with zucchinis..I still remember i bookmarked this bread at Dk's space since a long, i have completely forgotten to make this bread..Since i have choosed Dk's space for this month's Tried & Tasted hosted by myself, its time for me to cook up all my bookmarked recipes..Finally i baked this zucchini crown bread today and served along with a bowl of soup with this beautiful bread for our dinner and we loved it..Also Dk went for some parmesan cheese in this bread and i loved that concept, yep adding cheese in this bread brings more tastiness to this cute looking bread, but i have made few changes in this bread, yep i went for whole wheat flour along with all purpose flour for making this bread eventhough Dk went for all purpose flour also chilly flakes instead of pepper powder..Sending to Champa's Bake off & to Susan's Yeast Spotting..
Place the grated zucchini in a colander and sprinkle few salt, toss and keep aside for few minutes, then pat dry the grated zucchini with a paper towels and keep aside..Mix the flours, yeast and parmesan together along with chilly flakes..now add the grated zucchini and add luke warm water to make a stiff dough..knead the dough with enough flour until they turn smooth..
Place this dough in a greased bowl and arrange in a warm place until the dough doubled their size for 1-1/2hrs..punch the dough and knead lightly,makes 5-7balls from the dough as u desire..roll well the dough balls and arrange them in a pan, brush the balls with milk and sprinkle the sesame seeds over the dough, let them sit again for 30minutes..Meanwhile preheat the oven to 400F and bake this zucchini bread for 25-30minutes until bread crust turns golden brown.. 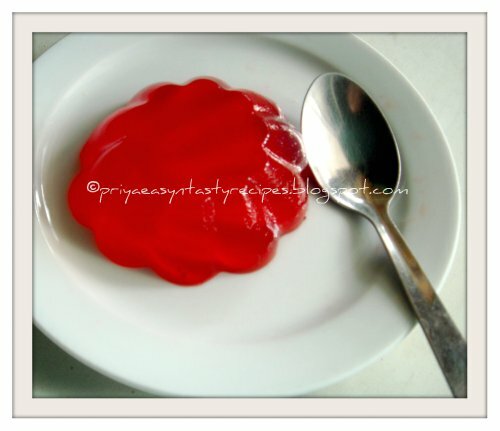 Enjoy with soup or with cream cheese.. 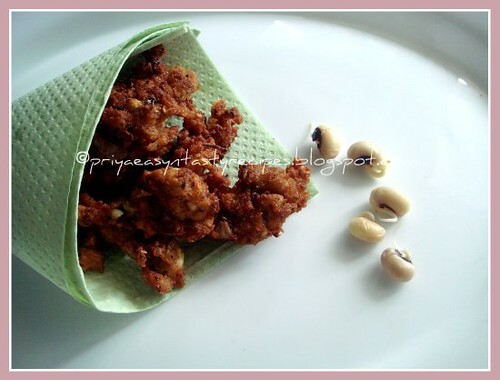 I have prepared these pakodas few days back with sprouted black eyed peas,i love sprouting the beans myself and i never stopped making them at home, this sprouted black eyed peas pakodas are quite a simple and easy snacks also a healthy snack eventhough its deepfried..This pakodas are prepared with a grounded black eyes peas paste spiced with onions, rice flour for giving more crispiness to the pakodas,green chillies,ginger, garlic and fennel seeds with salt and curry leaves..If u dont like them as deep fried snacks u can also prepare them as baked version..Even i tried baking them and they turned out prefect too, somehow i love this deep fried pakodas much when compared to the baked one.. Grind the sprouted black eyes peas, fennel seeds with salt as coarse paste, add the chopped onions, chopped green chillies, chopped ginger, garlic cloves, rice flour, curry leaves,mix everything well..meanwhile heat enough oil for deep frying, once the oil is hot gently sprinkle or drop the batter with ur fingers as pakodas, cook the pakodas until they turns golden brown, drain the excess of oil with a paper towel. 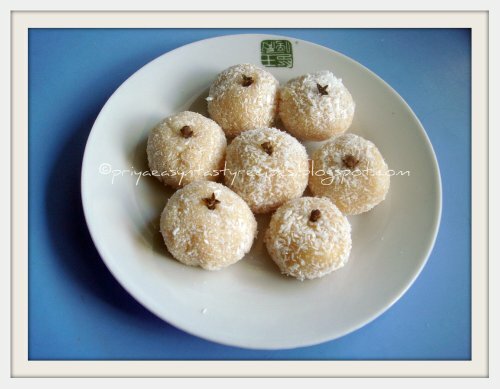 I can guess some of us would have surprised to see the name of this laddoos,yep i prepared this cute looking laddoos with tinned mango pulp and dessicated coconut flakes simply with sweetened condensed milk and cardamom powder, this delicious and gorgeous looking laddoos goes just for few minutes cooking in microwave oven and gets ready very quickly.. A real feast for mango lovers, i truly enjoyed munching this yummy laddoos..Also these laddoos suits quite prefectly for any festivals and this gonna be one of the sweets am gonna prepare for diwali since this laddoos goes for easy ingredients..
Heat the ghee, the dessicated coconut flakes, sweetened condensed milk, cardamom powder, mango pulp together in a microwave bowl in high for 10-15minutes (stir twice in between), let this mixture get slightly cooled..Take a small portion and roll them as laddoos, roll them over almond flakes and conserve them in an air tightened box.. 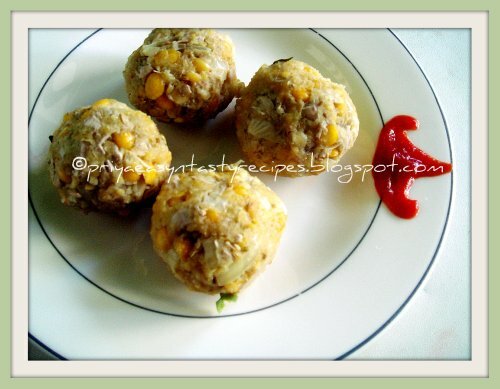 Recently i saw a cookery show and the dieticien who prepared this dumplings showed us how to enjoy healthy foods without oil also at the same time she told that this dumplings are healthy snacks to enjoy simply with either chutneys or with ketchup, i loved the way she prepared this dumplings and immediately i tried out with some leftover banana blossom chunks after making usili with them..This dumplings are truly healthy and i loved it simply..Prefect snacks completely guilt free and even my little ones enjoyed them for their snacks..I didnt prepared the same method as the dieticien went for, i did these dumplings as i always goes for making usual paruppu urundais..Even i prepared a gravy with this dumplings and i'll posting them soon..
Soak the channa dal in water for atleast 2hours, meanwhile steam cook the chopped banana blossom with salt (without adding water) or u can sauté them in a pan with few drops of oil...wash thoroughly the channa dal and grind the soaked channa dal with fennel seeds,salt into coarse paste, add the chopped onion pieces,chopped green chilly pieces,crushed garlic, ginger pieces, curry leaves, steam cooked banana blossom pieces and mix everything well with ur fingers, take a small portion and roll them as small lemon sized balls, continue making the dumplings until the grounded batter get finished, meanwhile heat a cup of water in pressure cooker n place the lemon sized channadal balls over a plate and steam cook as we do for idlies upto 10 minutes..
Keep aside n let them cool..Serve with spicy chutneys or ketchup..
Curau de Milho, a simple dessert quite served in Brazil during the month of june in parties called Festa Juninas, which celebrates popular saints like St John,Peter and so on..These celebrations are also important in North Europe country..This sweet custard like pudding is made from the juice of unripen corn kernels,cooked with milk, sugar and butter..To prepare the curau, the corn kernels are grated off the ears and put into a cloth bag. The bag is then squeezed while adding the milk little by little, so as to extract as much juice as possible from the ground corn mass.The extracted liquid is combined with the sugar and any other ingredients, and thickened to a creamy consistency by cooking on the stove for about 45 minutes stirring frequently. 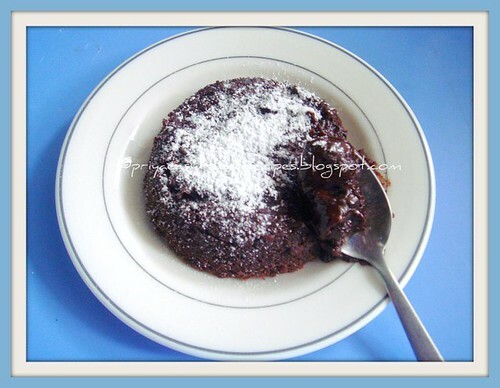 The cream is then poured into appropriate dessert cups, muffin molds, shallow baking pans..The curau may be served warm or cool. 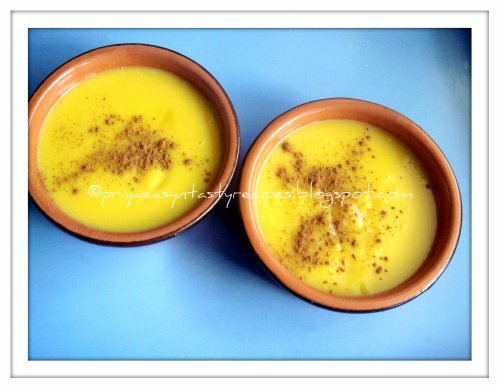 It is typically dusted with powdered cinnamon..But i went for sweet corn kernels and grounded them along with milk which was quite easier than the traditional way of making this curau.. Grind the half of the corn kernels with half of the milk, blend for bit coarse paste, strain this grounded corn in a pan, do the same process with the remaining corn kernels..Bring boil to the corn milk in medium heat, add the sugar and butter, stir continously until the corn milk will be creamy consistency..
Pour it in small ramekins or dessert cups and sprinkle the cinnamon powder over the pudding..Serve warm or cold..
Am honoured and happy to annouce that am hosting Tried & Tasted for this month of october, an event started by Zlamushka, which was taken over by Lakshmi of Kitchen Chronicles as Zlamushka was quite busy..Its a great pleasure to say that i have choosed a veteran blogger DK's Chef In You as this month's T&T blog for this event..The motto of this event is to try and taste the dishes from our fellow bloggers by re-creating them in our kitchen...Coming to Dk's space, most of us would have crossed her blog atleast once a while in this blogsphere since her space have many beautiful,healthy,nutritious, traditional,vegan, egg free, low calorie,gluten free dishes and her speciality is her step by stepwise pictures, even a novice cook or a novice baker never goes wrong with her recipes..U can see many traditional dishes to low calorie dishes going across many bakes at Dk's beautiful space, i love her bakes and we have no excuse to try and taste many beautiful dishes from her space.. So friends, do try any dishes from Dk's space and send it to me anytime before 10th november 2010..U have few rules to follow, just go on through them before sending ur entries to me..I'll be adding soon the logo since Ksenia of Tales of a Spoon is actually creating the logo for this month's T&T event, a special thanks to her for creating the logos for each and every month for Tried & Tasted event..
1)Cook any recipe(s) from DK's Chef In You and post about it. Stay as true to the original recipe(s) as possible. 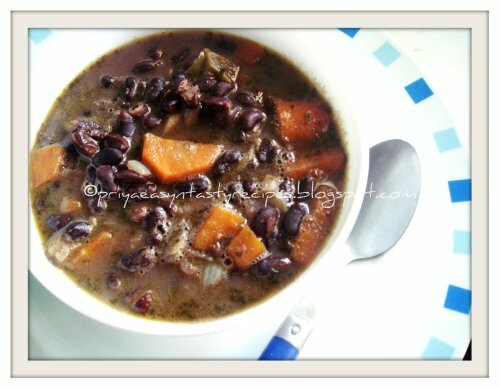 Therefore, there is no need for re-posting it, simply link to the original post..
2)There is no time-frame for the original recipe. It can be as old as my grand-mother or as fresh as a mung bean sprout. 3)Have you cooked from Blog of the month before? 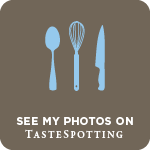 As this event is all about tasting and reflecting on the taste, older posts are also welcome. Simply link to this post and mention T&T event. 4)Link your post to link announcement and to Lakshmi's Announcement Page . Please always link to both sites, so both blogs are given credit and you are avoiding copyright fuss. 5)Send me an e-mail to Priyasuresh09@gmail.com with your name, your post URL as well as the original URL and a picture (300px by height, please). 6)Deadline is the 10th November and the round up will be posted within a week. 7)Non-bloggers are more than welcome to participate (after all, our posts are mainly being written for them). 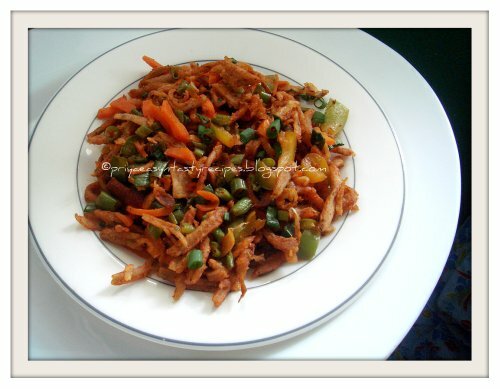 Simply e-mail me with your experience of what you cooked and please include a picture. 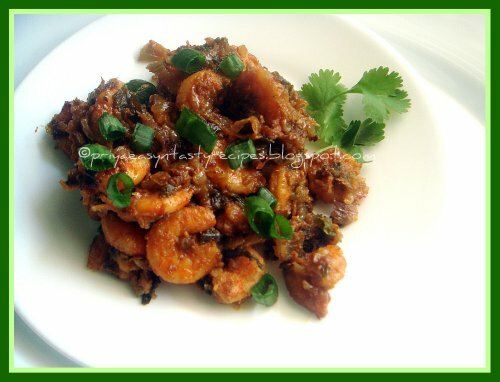 Its has been a long i prepared usili with banana blossom, this is one of a healthy dish to enjoy with sambar rice and rasam rice, i can enjoy this usili with anything, even as bread toast, i know usili in bread toast may sounds weird na, but this banana blossom is definitely a healthy veggie.. Banana blossom consume more time to get cleaned, eventhough this dish is worth to try..Healthy dish which is quite healthy, nutritious and delicious side dish..
Soak the dals for 2 hours, drain the dals well and take the dals with green chillies and red chillies with salt, asafoetida powder in a mixer, grind them coarsely, add the ginger to the paste...dont grind them as smooth paste..In a steamer without whistle, steam the grounded mixture from about 10 minutes, once cooled , crumble it well with your hands..
Heat enough oil in a pan, add the mustard seeds, urad dal..let them crack, add the chopped onion and slit opened green chillies and curry leaves, saute until the onion turns transculant, add the chopped banana blossom and saute for few minutes in simmer with enough salt until the banana blossom get half cooked sprinkle some water and cook until the veggies get well, add the scrambled dal to the cooked banana blossom and cook everything in medium high flame for 5 minutes, finally add the grated coconut and toss gently..garnish the coriander leaves.. 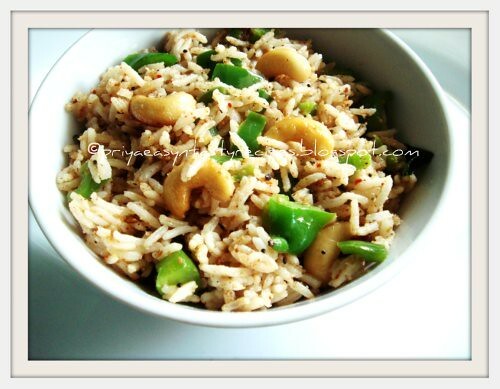 Serve hotas side dish for any rice dishes!! 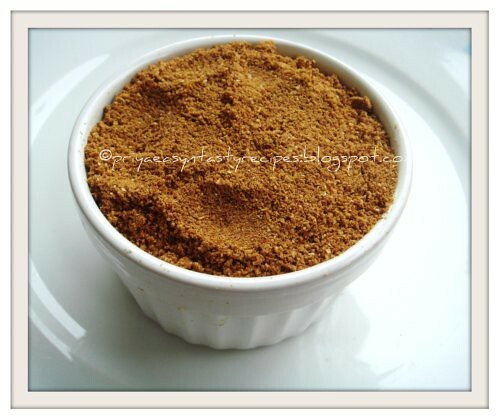 Beijinho de Coco is a Brazilian sweet which is actually prepared for children birthdays. But it's not only delicious for the little ones also for everyone and its quite a traditional candy in Brazilian's birthday parties, this coconut kiss is prepared simply with sweetened condensed milk, dessicated coconut, butter..Quite an easy candy na, yep this candy gets ready within 10minutes and i never prepared a candy in such a less time.. 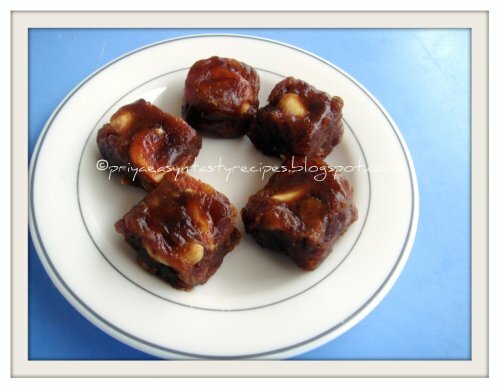 There are various way of making this candies, some may go for coconut milk, egg yolks and sweetened condensed milk, eventhough i went for simple and quick version..I enjoyed preparing and having this cute looking candies, traditionally this candies are served along with a clove inserted in their top, which turned this candies more cute..
Pour the sweetened condensed milk in a heavy bottomed pan and cook in simmer along with butter, dont forget to stir continously until the milk gets thickens, after 10minutes once it gets thickens pour the thickened milk over a plate and let them got slightly cool...Make small balls from this thickened milk and roll them over the dessicated coconut, insert a clove over the top of this candy..Store in fridge overnight before serving..
Am a great fan of channadal kheer and this time i tried them bit different by using carrots along with channadal, for my surprise both together works out wonder,I simply pressure cooked channadal and carrots and combined together along with jaggery syrup and condensed milk and its such an easy dessert, this droolworthy kheer gets ready in less time and we enjoyed having them warm..This kheer suits prefectly for any sort of festivals or either simply as a dessert after a festive lunch..Personally i felt adding carrots to this channadal kheer turned out more tasty also colourful without any food colour..Sending to Celebrate Sweets-Kheer guest hosted by Umm, event by Nivedita and to Only Festive Event guest hosted by Preeti, event by Pari..
Soak the bengal gram for half an hour, pressure cook the dals and carrots separately until the dals and carrots turns soft, grind coarsely the dals and grind as fine paste the carrots.... make a syrup with jaggery with a cup of water.. strain the jaggery water.. boil the jaggery water and add the carrots paste,grounded channa dal, condensed milk, cardamom powder... cook until they turns slightly thick..
Fry cashewnuts in the ghee and add the nuts to the kheer, also garnish the kheer with any nuts as u desire..serve hot or chilled! 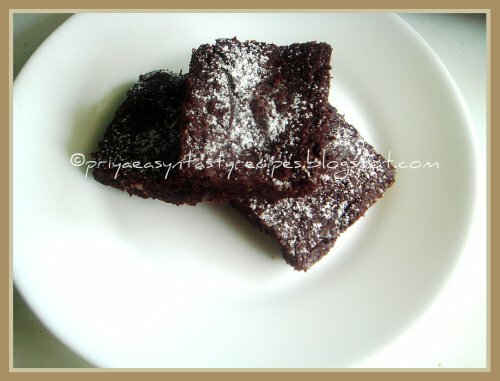 Brownies are our favourites i can even say that they are my family favourites..After making some molten lava cake, there were some remaining dark chocolate chunks and immediately i tried out this brownies using those leftover chocolate chunks, this brownies was quite dark in colour coz of the dark chocolate chunks i used for but tastewise i dont have words to say eventhough these brownies are vegan, yep i prepared this vegan brownies using soya milk , pureed silken tofu and vegetable oil..They tastes marvellous with walnuts and the crunchiness of the walnuts makes these brownies more tasty..Prefect for evening snacks with a cup of hot tea or a glass of milk..We loved it, i couldnt take a clear picture coz everyone started having them while these brownies were still warm...Sending to Shabitha's Virtual Party-Chocolaty Dreams..
Preheat the oven to 350F..Sift the flour, sugar, baking powder, baking soda together..In an another bowl, combine the soya milk, pureed silken soya, vegetable oil..Add the wet ingredients to the dry ingredients and mix well..finally add the walnuts to the batter, pour the batter to a greased pan..
Bake the brownies for 20-25 minutes or until a toothpick cames out clean..Enjoy warm! 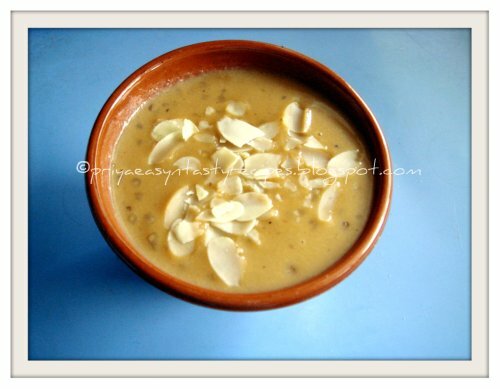 Have you ever heard about quinoa and moongdal together in kheer?? 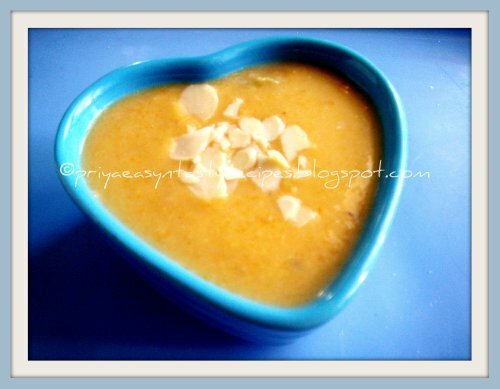 am damn sure that u never heard about so, thats y i tried this combination for the first time day before sterday for our lunch as i had some sudden visit from my relatives..Quickly i prepared some ghee rice with paneer butter masala and as dessert i served this droolworthy kheer and for the first time they came to know about quinoa, am glad that they had and learned about this healthy grain through me and also i insisted them to use atleast once a while in their menu..Coming to this kheer, its really very quick and gets ready with less time and less ingredients, i used sweetened condensed milk for making this kheer..In case if u dont have condensed milk, u can go for thick milk and sugar..Sending to CWF-Quinoa guest hosted by Priya Mitharwal..
Pressure cook quinoa, moong dal with 2cups of water upto 3whistles..once the steam get released, pour the cooked quinoa and moong dal in a pan, add the sweetened condensed milk, saffron strands, water (as u desire), bring boil everything, meanwhile heat the ghee and fry the cashew nuts until they turns golden brown..add to the kheer, put off the stove and finally add the cardamom powder..
Who will say no to this droolworthy cake, definitely not me..I prepared this molten lava cake sterday for the fourth time, everytime i prepared these cake, its vanished even before they get slightly cooled, yep we enjoyed them hot once they came out from the oven, sometimes i almost burned my tongue while enjoying these droolworthy cake..While they were warm, nothing will beat this yummy cake...Everyone at home enjoyed and asked me to prepare often, thats y sterdary was my fourth trial...Everytime i enjoyed making and having them..This molten lava cake was choosed by Divya for this month's sweet punch and its our's october Sweet Punch bakes..This molten lava cake goes for quick baking as the centre of the cake shouldnt be cooked well..Since i used the dark chocolate for making this cake, its was quite dark else they tastes really marvellous, i just went for more sugar else i followed as per the original recipe..Thanks to Divya for choosing this yummyilicious ooey gooey cake, we loved it.. In a double boiller,melt the chocolate, preheat the oven to 350F..once the chocolate melts completely add the butter and stir well, in a mixing bowl beat together the sugar and eggs until they turns light anf fluffy..Add in the chocolate butter mix and flour, beat everything together until they turn smooth..grease the ramekins with butter and pour this cake mixture in the greased ramekins.. Arrange the ramekins over a baking tray and bake for 10-15minutes (mine took exactly 12minutes)...Enjoy warm! Eventhough Sun god is not often present here, i dont forget to make my pickles when its summer here..My DH love pickles, mostly his favourite goes for mango pickle or lemon pickle...Sometimes i go for easy veggies pickles, my mind immediately goes for instant version, this time i prepared pickle with carrots, since my vegetable basket always have carrots..This carrot pickle is very quick and also tastes awesome with curd rice, sambar rice or along with lemon rice..Carrot pickle is one of the easiest and most economical pickles to make..With a bright beautiful orange colour, this pickle goes awesome even with rotis too..It can be eaten the same day its made, but they will stay prefect even for three or four days if they are kept in fridge..
Dry roast the mustard seeds, fenugreek seeds, asafoetida powder and grind as fine powder..heat oil, let splutters the mustard seeds, add immediately the carrot jullienes and saute in simmer until they get bit cooked, add immediately the red chilly powder, salt and grounded powder (as per need) and saute until the veggies gets well coated, take care not to over cook..Carrots should stay bit crunchy..finally add the lemon juice and put off the stove.. 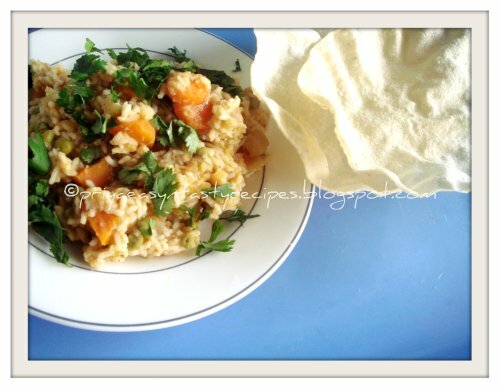 Enjoy with any sort of rice or rotis.. I tried out recently this quinoa, mixed beans and mixed dal Adai for our dinner, this crispy adai tastes awesome with a beautiful golden brown colour tastes awesome when served with any sort of spicy chutney, this adai is definitely a protein packed dish also its one of the best and better way to sneak quinoa, most of us know very well about the nutritional value of this tiny grains and i started making delicious dishes from this grain only after starting this blog, yep i learned many new things through this blogsphere and quinoa is one among those..This adai batter doesnt need to ferment and can stay prefect for two to three days if this batter arranged in fridge...Sending to CWF-Quinoa guest hosted by Priya Mitharwal..
Heat a nonstick pan...pour a ladle of this adai batter, drizzle the oil and cook on both sides until the adai get well cooked..Serve hot with spicy coconut chutney..
Actually i prepared this chutney by accidently..Sunday i asked my hubby to get coriander leaves from the nearby chinese store, seems he picked some flat parsley leaves which ressembles quite like coriander leaves and i didnt noticed this..Yesterday we had some quinoa dosais for our dinner and i wanted to makes some spicy coriander chuntey as a side dish, but while washing the leaves i noticed that its parsley leaves and dont want to throw them away so i added them along with grated coconut,roasted gram,ginger,green chillies and prepared this chutney, which tastes awesome with crispy dosas, if u dont like the smell of raw parsley leaves, just stir fry them for few minutes before grinding.. 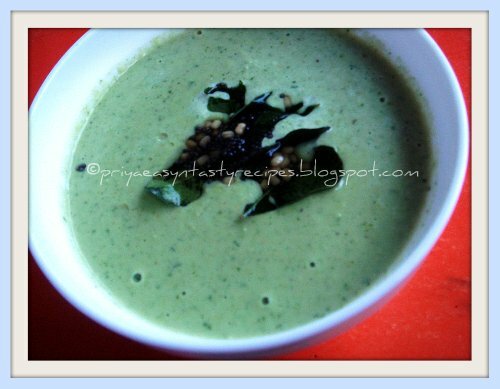 Grind the parsley leaves, grated coconut, green chillies,grated ginger, roasted gram with salt as bit coarse paste, transfer to a serving bowl, heat enough oil and splutter the mustard seed,urad dal, curry leaves..add this tadka to the chutney and serve immediately.. 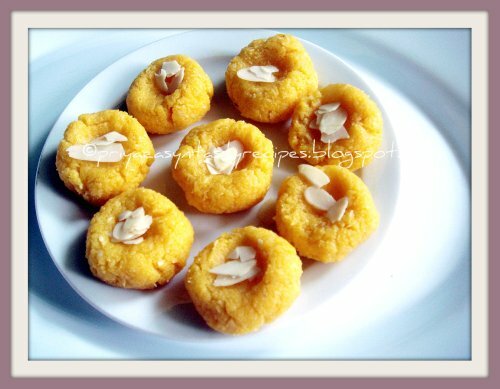 I cant say that am an expert in making pedas but i manage myself to prepare them whenever i have sudden guest or for any occasions with various variations and this time my choice went for mango and coconut peda, i prepared this pedas last weekend for an occasion which went over awesome at my friend's home, she planned her menu herself and asked me whether i can get some sweets for her, first i planned to make some gulab jamun and finally went to this pedas, coz of a tin of mango pulp and packet of dessicated coconut also coz of the ricotta cheese i bought recently, immediately i combined all these ingredients with sugar and milkpowder and prepared this cute looking pedas..Its was big hit at my friend's place and i was really happy when the whole plate vanished within few minutes..Also this pedas get ready in less than 10minutes, so u dont have any excuse to try out these beauties..
Take a microwave bowl, add the ricotta cheese, sugar, milk powder,dessicated coconut, mango pulp,butter, stir them continously until the cheese gets well mixed, this may looks as creamy paste.. microwave in high temperature for 5 minutes cook this milk mixture, they may doubled their volume, stir them once and cook again for 4-5minutes (stir in between) until this mixture turn as bit hard..
Now transfer to a flat plate.keep aside and let them cool..once they get cooled shape them as pedas, arrange the almond flakes over them and serve.